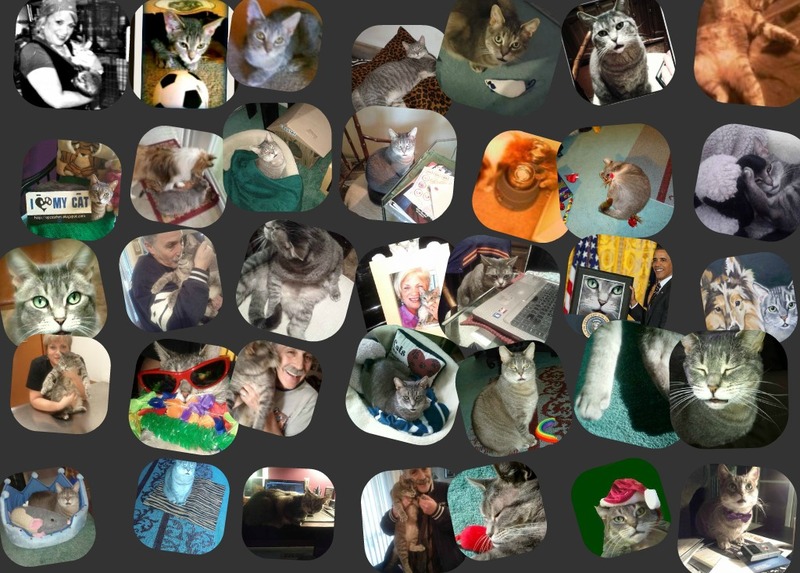 Cat Chat With Caren And Cody: Happy Birthday Cody!!!! You're 6! Happy Birthday Cody!!!! You're 6! Looking at these photos it seems they were all taken in the blink of an eye. Times goes by much too fast. Cody was a blessing sent to me by my Angel Bobo who passed 2 weeks before I adopted Cody. He helped soothe my broken heart. Cody is a lover, cuddly, a great brother, clever, cunning, a clown, food obsessed, and he has a belly that swings from side to side when he runs! Our lives are truly blessed! 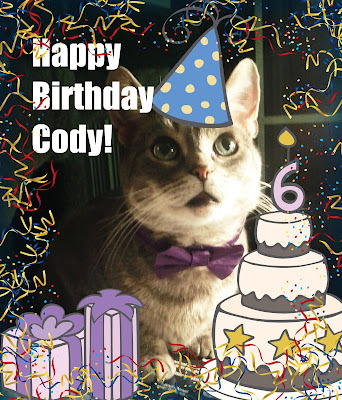 Today we are celebrating Cody's SIXTH BIRTHDAY with the SECOND of what will be FOUR GIVE-AWAYS! ( If you missed the first give-away click here, there is still time to enter!) We hear that a number of other kitties have celebrations today as well, everything from more birthdays, to gotcha days to blog-o-versaries! Cody and I want to send lots of love to ALL KITTIES CELEBRATING TODAY! I simply LOVE Kelly from Bax Cat & Co. and all of the special things that she makes! Kelly specializes in organic catnip toys, cat mats and "other homemade goodies for your special cat"
I was honored that Kelly agreed to do a give-away in honor of Cody's birthday, and look at the adorable catnip toy that Kelly sent to Cody for his birthday! It's a GREEN BIRD from Kelly's Etsy Shop! that Kelly made for her shop! Here are photos of Cody enjoying his present! Cody thinks it is highly swattable, huggable and bunny-kickable which all translates to FUN! WANT TO FIND OUT HOW TWO PEOPLE WILL WIN? You will, AFTER you check out some of Cody's birthday cards! Cody is such a lucky kitty!!! He received two super cool birthday cards! 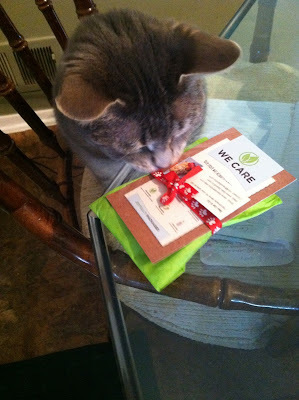 The first is from his buddy Sammy from the adorable blog One Spoiled Cat! that my buddy Sammy made me! Then! I got a card from one of Dakota's favorite friends!! Easy!! (Yes, "Easy" IS his name!) He is easily one of the funniest dogs on the web! If you haven't read his blog, you MUST read it right here! Thank you both sooo much! You are great furiends!! Now, would you like to know how you can enter the give-away? GIVE-AWAY IS OPEN NOW. THERE WILL BE TWO WINNERS!! ONE FROM THE U.S. AND ONE FROM ANYPLACE ELSE IN THE WORLD!! (Both winners will be chosen by www.random.org) and will each WIN ONE catnip birdie! Winners will be announced on WEDNESDAY, APRIL 10TH!! TO ENTER: Leave a comment wishing Cody a Happy Birthday and be sure that you mention that you wish to enter the contest! WANT EXTRA ENTRIES!? FOLLOW KELLY!Complete any or all of the items listed below and leave a comment telling me which ones you chose. Those are worth one extra entry each! Good Luck and HAPPY, HAPPY BIRTHDAY TO MY SPECIAL BOY!!!! I LOVE YOU!!! Happy birthday Cody! We hope you have a wonderful day. Happy Birthday Dear Cody! And many more...I'z got my jazz paws going for ya full force buddy and wish you the most awesome of days and Birthdays! Very cool catnip birdie, the design is beautiful. We would like to enter please for the international giveaway! Enjoy your super special day! We liked Bax Cat and Co on Facebook for an extra entry. And we're following them on Twitter too! Have an awesome birthday, Cody! My human says we have too many toys already! Which I think is not fair because I think Bax Cat's toys are awesome too. And yes enter us for the contest. Feel free to visit www.riverfrontcats.com to win our Litter Genie giveaway as well. Many blessings. You are so handsome. we have a Riverfront kitty with gray fur and green eyes that is your female counterpart. Would love to get her off the streets. Would you like a mirror image? Aww Happy Birthday Cody! I love the picture of him nomming the package, he looks like he wants it really bad lol. I'll enter this giveaway, maybe one of the barn kitties likes catnip? Idk yet! I followed Kelly on Twitter. We would love to get our paws on one of those birdies too! 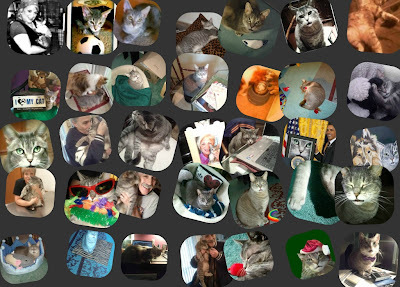 We really like the collage with all your photos. It's always fun to see how we change through the years. PS, please include us in the giveaway. No kitty can have too much catnip. Happy birthday to you, dear Cody! And to think that you are generous enough to share presents with your friends, too! We would like to enter to win that cute catnip toy! Happy Birthday Cody! Hope it's a great one! Hope you have a wonderful day and many more to come. Happy Birthday Cody!! I'd love to enter the contest. But happy birthday pal! Happy Birthday, Cody, from Allegra, Ruby and me! Hope it's filled with lots of treats and purrs! Happy Birthday Cody! I hope you all have a lovely day. A very Happy Birthday to you Cody. That looks like a great toy. Hope you have a terrific day. Take care. 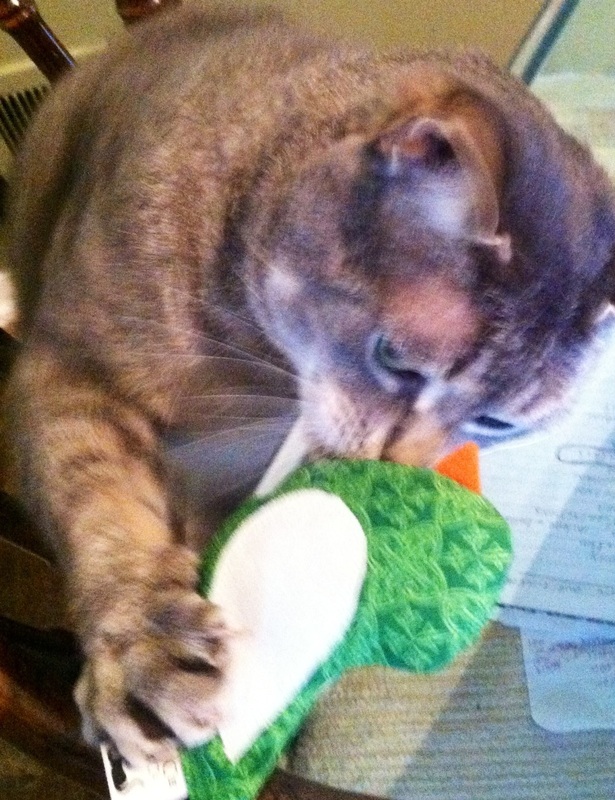 And yes, my cats would love a chance to win this great looking toy. Hope you have a wonderful celebration with lots of nip. Yes! We'd like to win the nice birds toy. Good luck to those who enter for the give-aways, we won't. Happy Birthday to you, Happy Birthday to you, Happy Birthday Dear Cody! Happy Birthday to you. 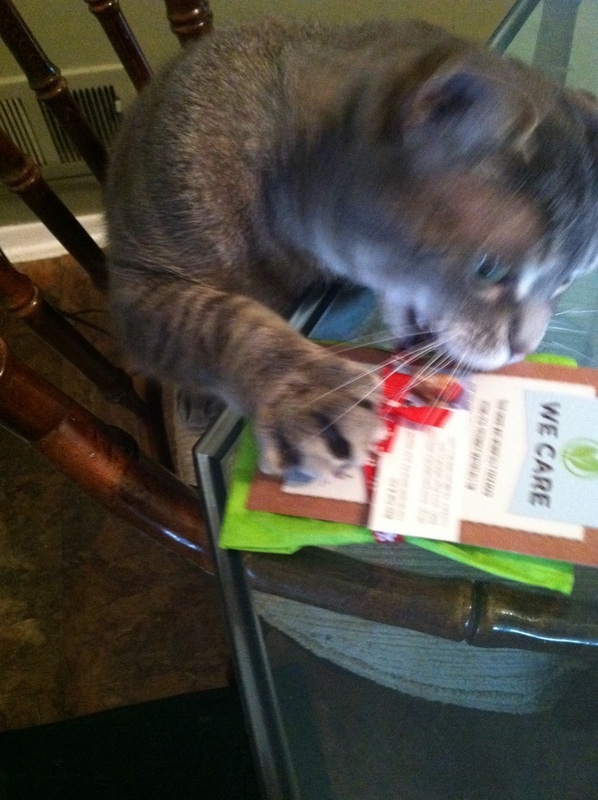 We would love to win one of the organic cat toys, we love organic cat nip. Happy Birthday, Cody! You are a lucky boy! Your stuff looks fun! We would be happy to enter your your giveaway. I join in with the giveaway too! HAPPY HAPPY 6th birthday Cody ! Me too fo course want´s to be in your give away ! Happy Birthday, Cody. On your birthday, we would try to refrain from chasing you. Luv and licks, Beckett and Keltic. Happy Birthday Cody! Purrs from all of us! Happy Birtday, darling Cody!! We hope you have a wonderful day and are so grateful that you have such a loving and happy home to celebrate in! 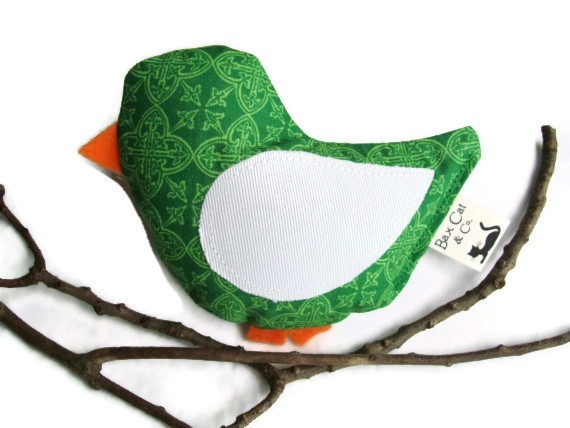 The birdie toy is adorable and our Zee would love to add it to his collection! xoxoxo - Purrs from the Zee/Zoey gang! Happy Birthday Kitty Kitty, Happy Birthday to you. Happy Birthday Cody Kitty, Happppy Birthday...to youuuu! Wishing Cody a Happy Birthday & I would love to be entered into the contest too. Happy Birthday, Cody! Party purrs just for you!! We'd love to win a birdie of our own! Happy Birthday Cody! How pawsome that we have birthdays on the same day! Hope you have lots of fun today. Purrrrrs. Happy birthday, Cody! We love you, pal! We'd love a chance to win one of those awesome bird toys. They are almost too cute to play with. Almost. Happy Birthday, Cody! Looks like a special present! Hippo birdie two ewe, Cody! Happy Birthday and Easter too! Happy Birthday Cody! We just checked out the website and those toys look pawsome. We're following them on FB now too! Please enter us in the contest! HAPPY BIRFDAY, Cody!!! Dat iz wun COOL birdee u'z got, dere... 'n I can tell it'z a reely PAWSOME toy, frum da way u'z keepin ur sharpeez dug in deep, molmol! Wishin u a purrfect day... 'n menny, menny, MENNY moar purrfect dayz ta come! And could we be entered to win this cool toy! Lots of love from your brother from another mother - Eugene, and the girls - Nikita and Blanca - and of course from me too, The Mom (Sarah). Happy Birthday, Cody! My sisfur Little Bit has her birthday today as well. She's nine, but mommy says it seems just yesterday that she was a tiny kitten that fit into her hand. Purrrrrrrrrrrrrrs. Oh, and we'd love to be entered in the contest. Purrrrrrrrrrrrrrs. Happy bird day dear Cody I mean birthday dear boy much love from Layla, Merlin, Domino, Gris Gris and Odin. We'd love a birdie. Congrats too on being making the cut for the AmazeCats Top Cat! Cody! Me has come first to tells yous that my post Me scheduled (Man Cat Monday featuring Yous) did NOT publish!!! Me wanted to surprise yous! And Now me is going to sing yous the song!!!! Nellie told me it was birthday. Happy Birthday to you Cody. Have a pawesome day! I liked Bax Cat and Co on Facebook. Forgot to say I would like to enter contest too. Thx. Happy 6th Birthday, Cody! Enjoy your day from all of us senior kitties. Aw, happy happy birthday Cody!! Have I ever mentioned that I LOVE your black lipstick? It's just too cute! Happy Birthday Cody! Six is a great age...and that birdy looks FAB! 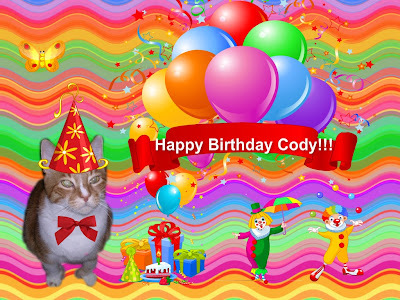 Oh Cody I think it's so cool that you and Boo share a purrday. WE're celebrating right along beside you and wow we would love to enter your giveaway! Happy Birthday and many happy moments today and always. Mom went over to Kelly's Website and Facebook page, so we has an extra chance! Happy Birthday handsome Cody! I know you will have a special day and you deserve it!!! Wishin you a Happy Birthday Cody! It mai birthday today too. Pwease enter our name for the birdy toy giveaway. Hopez you haf a purrtastic day. 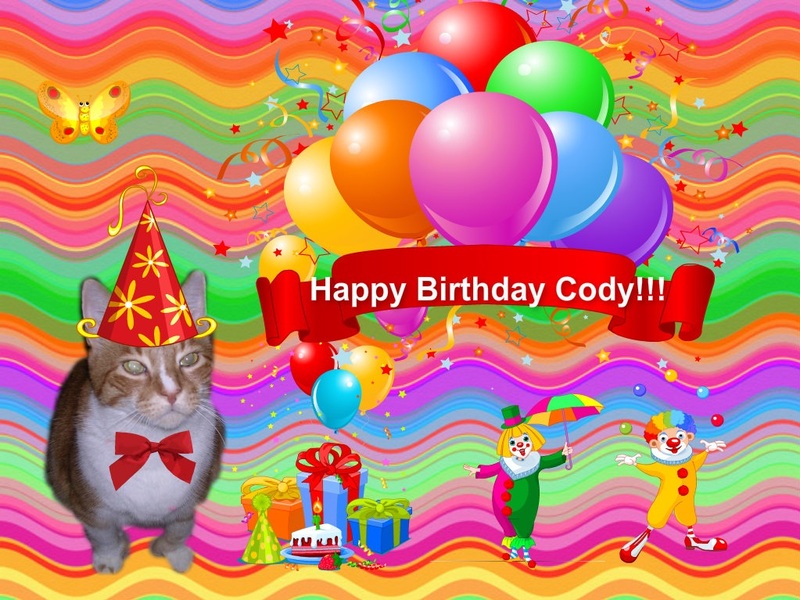 Happy purrrrday cody! What awesome pressies you got! Happy Birthday Cody, those cards are great. Can you enter me in the contest please, Cody would love that. I would like to enter the contest please. Oh buddy happy birthday to you!! I hope you have the best year ahead!! PS we would like to enter our cats in your contest. They never get treats. Happy Birthday sweet Cody. I would like to enter the contest. I love Kellys stuff. Happy Birthday Cody! *Hugs* Barb & Yuki. We would love to enter your contest. Happy 6th Birthday Cody !!!!!!!! Happy Birthday Cody. You're looking you found your Mom cos she's a great cat Mom. She loves you bunches. Heh heh, I'd like to enter to win one of those birds. Thank you! Happy Birthday Cody! Has another year gone by? It doesn't seem possible! We hope you had a fabulous day and wish you many more happy years. Purrs! We'd like to be entered in the give away too! OMC Cody! The Human was out for hours and hours....but where we are it's still 10 p.m. on April 1st, so HAPPY BIRFDAY!!! I hope you had the greatest day ever! Love your new birdie! Happy Birthday, Cody! I know you'll love your catnip birdie - my cats got their first one from Kelly almost a year ago and they still love it (they also haven't managed to destroy it, despite their best efforts)! I'm sure my cats would love another one - enter us in the giveaway! Yikes and oops! Sorry I missed your birthday, Cody. Which means, Penny the Jack Russell dog and me, her mere human, send you belated birthday wishes. Happy Birthday Cody! You are a true friend to me & my 2 blue mancats. Hope you a birthday filled with presents and a wee sip of that Catcord wine for Passover last week. The blue brothers would love to share a catnip birdie. Thanks for introducing me to the Etsy shop! Happy Birthday, cody! I wish to enter the giveaway! 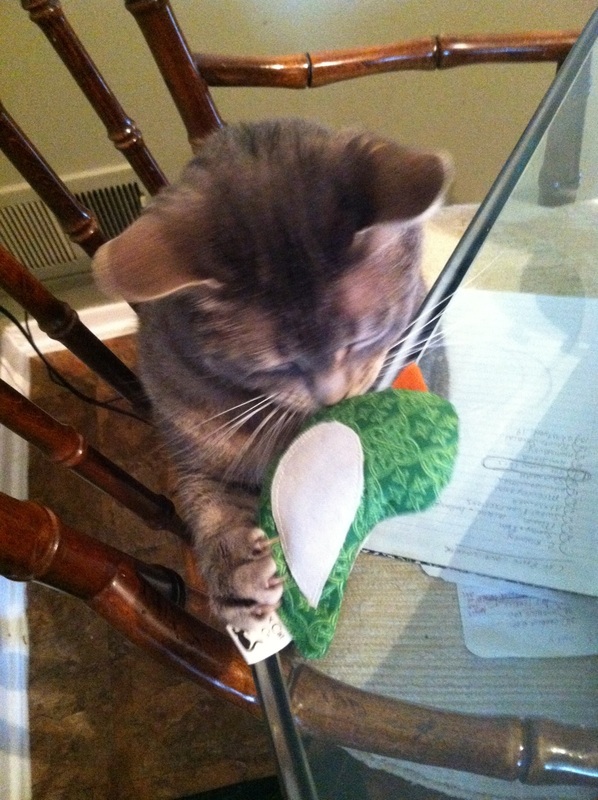 My cats would love a catnip birdy. Cody dood! We missed your birthday! (we're sooo ashamed!) Our humans went out of town for a passover part 2 with relatives fro the other side of the family and did not catch us up with our friends til now. We TOLD them that was NO excuse!! Maxwell: Dood. 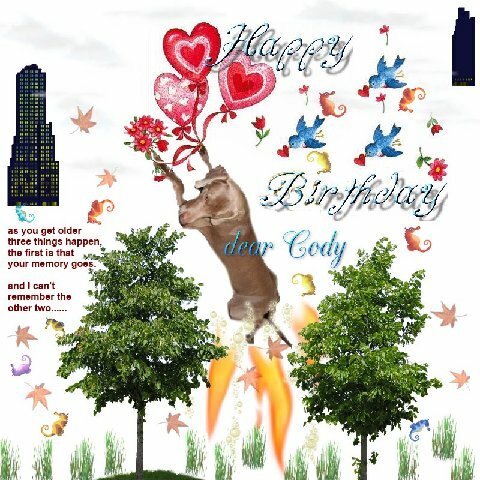 The bestbelated gift you can give Cody is to NOT sing. Trust us on this. Happy Birthday Cody! *Hugs* from Barb & Yuki. We would love to enter the contest, and we already follow Kelly and her kitties on Etsy, facebook, twitter, and their blog.